IgD, one of the five antibody classes, is considered an enigmatic player in the immune response—we do not understand well what it does. IgD is present on the cell surface of “mature naive” B cells as a major component of the B cell receptor, or BCR, and is secreted in very limited amounts in the circulation. But what are “mature naive” B cells? These are B cells that, after undergoing various stages of development in the bone marrow, enter the circulation—ready to bind foreign specific antigens for the first time. In other words, they’re ready to recognize, through their BCR, antigens from invading microbes. Most B cells that respond to self-antigens are eliminated in the bone marrow at the so-called immature stage in order to avoid damaging responses, or autoimmune responses, against our own organs. However, not all cells that respond to self-antigens are eliminated—some reach the circulation, undergo “clonal anergy,” and can be found in secondary lymphoid organs such as lymph nodes. Human B Lymphocyte. NIAID, NIH. CC BY 2.0. First proposed by Gus Nossal, the “Clonal Anergy” theory suggested that self-reactive B cells become anergic—or unresponsive—and, although present in the circulation, fail to be activated when encountering antigens that their BCR can bind. 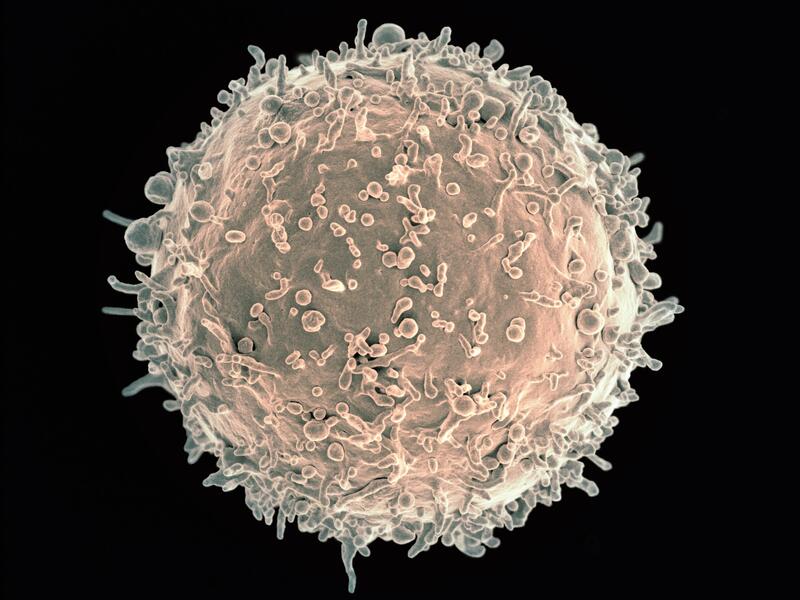 Later, other researchers found that self-reactive T cells can also undergo clonal anergy. Such mechanism prevents the development of autoimmune diseases, which are characterized by immune responses that attack our own tissues. For example, in autoimmune diseases such as systemic lupus erythematosus, rheumatoid arthritis, and type 1 diabetes, self-reactive B cells produce auto-antibodies that induce considerable organ damage. Now, results from a new study (IgD attenuates the IgM-induced anergy response in transitional and mature B cells) published in the journal Nature Communication on November 10, 2016, show that IgD is responsible for inducing clonal anergy in self-reactive cells, thus inhibiting production of auto-antibodies, or antibodies that bind self-antigens. In other words, IgD keeps self-reactive B cells in “lockdown”—unresponsive to the body’s tissues, yet still capable of producing antibodies against invaders. The researchers carried out their study in a mouse model. They evaluated gene expression across the whole genome in locked down (or anergic) B cells, comparing mice with or without functional IgD. The study results revealed a core set of over 200 genes, one third of which are controlled by IgD, that together keep the cells unresponsive to the body’s own tissues. The study results also indicated that the B cells in lockdown are not removed from the immune system. On the contrary, they accumulate in the spleen and lymph nodes—just as other B cells do—thanks to mechanisms controlled by IgD. If necessary, these cells take part in “target training” to make antibodies against invaders. What is “target training”? In specialized areas of the lymph nodes called germinal centers, B cells undergo the process of somatic hypermutation, which induces structural changes in the antigen-binding site of the BCR. Thus, this process fine-tunes the antigen-binding site—a BCR originally directed to a self-antigen may become able to recognize a foreign antigen. Once the B cell with the changed BCR recognizes the specific foreign antigens, it becomes a plasma cell that produces large amounts of secreted antibodies against that specific foreign antigen. IgD’s is a surface protein on immature B-lymphocytes commonly found associated with IgM. As with most antigen binding cells, B-cells are capable of recognizing self. This ability is mostly avoided during immunological development. If left unchecked, identifying own antigen and cells can result in autoimmune disorders, the body attacking its self. Even with this potentially damaging effects, the body will maintain B-cells with this capacity. Luckily, IgD inhibits self-recognition and thus increasing the total number of B-cells available in the incident of an attack by microorganisms. Haerzschel et al reported their finding on IgD role in chemotaxis for chronic lymphocytic leukemia. They found an increase in IgD presence and associated calcium influx within the cancerous cells. I would be interested to know the role if any, this plays with the likelihood of autoimmune disease emergence, but the authors did not speculate. 1. Haerzschel A, Catusse J, Hutterer E, Paunovic M, Zirlik K, Eibel H, Krenn PW, Hartmann TN, Burger M. BCR and chemokine responses upon anti-IgM and anti-IgD stimulation in chronic lymphocytic leukaemia. Ann Hematol. 2016 Dec;95(12):1979-1988. Epub 2016 Aug 20. This article raises a fine point about how naive mature B cells and T cells can be selected by IgD as self-reactive. 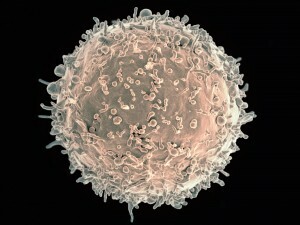 However, a study by Zikherman and colleagues in 2012 showed that this clonal anergy can occur in mature B cells in mice. They showed that even after the B cells have been activated by an antigen and begun circulation as plasma cells, they still go through the fine tuning for their BCRs. This is an important distinction as this implies that IgD is not only functional for naive B cells but that even plasma cells undergo selection and fine tuning. This could also help to determine if there is another factor besides IgD that might factor into autoimmune diseases. The autoimmune responses are caused by the immunity system that will fight its own healthy tissues and cells. This response will cause autoimmune diseases. This study discussed the IgD would induce the clonal anergy to prevent autoimmune responses. The IgD and IgM are different because the IgD will weaken the anergy response subsets to self-antigen. In addition, the surface expression of antigen receptors increases in IgD and decreases in IgM will induce self-tolerance of the B cells clonal anergy. The number of mature B cells is smaller in gene-altered strains with polyreactive BCR than IgM-only or IgM and IgD. Also, the bearing IgM-only transgenic strains that express more mature B cells than bearing IgM and IgD transgenic strains. However, when IgD is removed, how does it still have the inhibitory effect? When IgD weakens surface IgM, the overstated responses to self-antigen still appear, but on the anergic cells surface, the IgD is not expressed, which means the IgD will decline the act of IgM. However, B cells are locked by IgD, how could the cells act normally when they meet an invader? I enjoyed reading how this article explains how the antibody, IgD, plays an important role in immune system maintenance by essentially restricting B Cells to specific actions so that pathogen recognition remains high and autoimmune attacks remain low. However, it was mentioned that the study was carried out on mice models. In a similar article, Sabouri et al. states, “Results show that IgD attenuates the response to self-antigen in anergic cells and promotes their accumulation.” Like this article, Sabouri et al. shows that IgD antibodies play a role in suppressing B cells that respond to self-antigens, but their study was also done on mice. I would be curious to see how IgD immunoglobulins function in human immune systems and if they play the same role in B Cell “lockdown” like they do in mice. In relation to B-cells and anergy, a study done by Janie Akerlund and colleagues showed that a signal pathway done by B-cells is crucial to maintaining anergy. Akerlund and colleagues demonstrated that B-cell activates inositol 5-phaosphatase SHIP-1 in anergic cell to increase affinity. It was shown the absence of SHIP-1 reduced the expression of IgM but not IgD. In their experiment, they accidently found that SHIP-1 also help mature MD4 cells proliferate in first exposure to autoantigen. However, the MD4 cells are not able to differentiate and become antibody secreting cells. I find this study important because if naive B-cells can proliferate but not differentiate, a study in SHIP-1 mechanism in that organisms can provide answers. Future study can be done on drugs that can replace STEM-1 deficient to improve immunity in that person. It is very interesting to note that the Nature Communications Journal study suggests that IgD plays an important role in inhibiting self-reactive B cells to body tissues but activating its response by producing antibodies against invaders. In another study by the Nature Immunology Journal, Rudolf Übelhart and colleagues tested the responsiveness of B cells regulated by the hinge region of IgD. While the importance of IgD on B cell function is still somewhat unclear, this study shows increased IgD/IgM ratio on conventional B-2 cells is important for preferential immune responses to antigens in immune complexes also increasing IgM expression on B-1 cells is essential for B-1 cell homeostasis and function. As having someone very close become a patient with systemic lupus erythematosus, I have always found the illness quite fascinating. The very thing that is supposed to keep us alive, healthy, and well can do the complete opposite and fight against its own teammates. This blog gives such great insight of how exactly we have evolved a mechanism of our immune system that is set up to avoid damage from this autoimmune phenomena. I did not know that many of us humans actually have antibodies that are constantly suppressing certain B-cells from expressing when it is not advantageous for the human. With the help of the igD antibodies, these immune attacking B-cells are not able to be activated to attack immune cells. So my question stemmed from this article is what happens to IgD in systemic lupus erythematosus patients? The attached article explains how their research shows B cells that are producing anti-NPA IgG antibodies are highly correlated with mice infected with a lupus-like disease. Is this the direct reason for autoimmune diseases? This also leads me to question if IgD antibodies do not work in the immune system of systemic lupus erythematosus patients or are they simply not there? The notion of this response is to expound on the function of T – cells in type 1 diabetes (T1D). T1D is an autoimmune disease characterized by the degeneration of pancreatic β cells caused by CD4 and CD8 T cells. T cells are stabilized by major histocompatibility complex (MHC) class I and II proteins, in which the structure of class I variants (A, B, C) and class II (DR, DQ, DP) are highly polymorphic. Polymorphism in these structures are due to difference in amino acid usually saline, valine, glutamate etc. The mutation of amino acids produces T cells that recognize its own cells as potential threat to the body. B cells and T cells therefore organize in lymph nodes and mediate peri-insulitis. This article really clarifies the theory of clonal anergy. Naive B cells in the immune system fail to be responsive and do not react to invading pathogens. This process does decrease the probability of developing autoimmune disease. This can also be seen T cells. The IgD is ultimately responsible for this process. However, a study research by Zikherman concluded that clonal anergy could also be seen mature B cells, as it was carried out in mice. This might further raise the questions of the other functions of IgD cells and the other many effects it has on autoimmune disease. The original study discusses how Ig-D and Ig-M have been shown to induce slightly varying levels of calcium signaling within a cell in response to monomeric antigens. This signaling is thought to be, in part, responsible for the “unresponsive state of anergic B cells.” Considering the previous statement made in the post above that mentions T cell ability to also undergo clonal anergy, we can discuss the mechanism by which they do so. TLR’s (toll-like receptors) mediate negative regulation of activation and cytokine production of CD4+ cells, according to Dominguez-Villar, et al. It was found in their study that the expression of TLR7 on CD4+ T-cells specifically lead to their complete anergy. TLR7 does this by inducing an intracellular calcium influx, much like Ig-D and Ig-M have been shown to do. However, Dominguez-Villar, et al. pose this mechanism with a negative connotation, as the rest of their study focuses on blocking the actions of TLR7 to reduce the effects of RNA viral infections, such as HIV. How might it be that that the anergy presented in these cells can be unwanted, while B cell anergy in the original study is considered good and possibly “a preventative mechanism to autoimmune diseases.”? I found this article to be very interesting as IgD pertains to the immune system but scientist have yet to understand how this antibody class works, until recent study. This blog states that IgD will “lockdown” a B-cell if it causes harm to the body but does not eliminate it. A study by Wu in 2016 shows that patients with rheumatoid arthritis (RA) have high levels of IgD, which release inflammatory cytokines that help with tissue and joint impairment. This can relate to the idea that in RA patients, IgD are “locking-down” those cells that are affected and instead helping with the damage of other cells. Wu also stated that IgD plays a key role in RA pathogenesis. I wonder what IgD can undertake in other autoimmune diseases and if it has separate tasks in different disease types. Reference: The Elevated Secreted Immunoglobulin D Enhanced the Activation of Peripheral Blood Mononuclear Cells in Rheumatoid Arthritis. This post talk about how IgD play an important role in regulating B cells that are react to self-antigen by inducing clonal anergy. By doing so, the releasing of the antibody that attacking self- antigen has been inhibited while those B cells are still capable of secreting antibody to attacking invader. This mechanism is very important in immune response because many of the autoimmune diseases are resulting in the lymphocytes attacking self-antigen. For example, Inflammation bowel disease (IBD), which including Crohn disease and ulcerative colitis, are resulting in the chronic inflammation in the digestive system. Although the actual cause of the disease is unknown, some of the researches show that the number and local distribution of the immunoglobulin containing cells are different in people have IBD compare with normal healthy people. According to Baklien’s study, the number of IgA, IgM and IgG immunocytes are much higher in the intestinal mucosal layer of the IBD patients than normal healthy people. This shows that the level of inflammation is high in the patient’s intestinal mucosa. However, they also found that the level of IgD and IgE immunocytes is lower in the patient’s intestinal mucosa. Although they didn’t talk about why the level of IgD and IgE is lower in the patient, after reading this post, I think one of the reason is that the decreasing of IgD level may account for one of the factors that trigger autoimmune response in the intestinal mucosa. I hope that future study can be conducted to investigate the relationship between the level of the IgD and inflammation bowel disease. Leave a Reply to Markisha H. Click here to cancel reply.